Real Madrid defeated Getafe by 4-2 in the Santiago Bernabéu, but the game wasn't as easy as the final score might imply. Cristiano Ronaldo scored his 4th goal in La Liga and assisted magnificently Karim Benzema, who scored 2 goals. Higuain scored the final goal in this Real Madrid win. Even though tonight's match had a total of 6 goals, the game was played at a slow pace for most of its period. Real Madrid couldn't hold the ball possession with the quality that we became accustomed to see when this team plays and there were many goal scoring chances created out of errors, bad passing and low aggressiveness, specially from the midfielders. As a clear sign of an exaggerated passivity during the 1st half, we could simply look at Cristiano Ronaldo number of shots (2), who was well below of his standards. 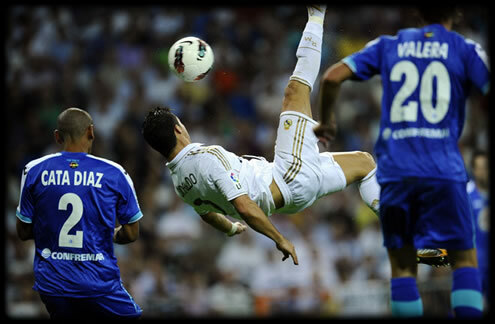 Watch Cristiano Ronaldo game photos vs Getafe. Even playing slowly, Real Madrid managed to take the lead, after a good combination of passes between Di Maria and Ozil, who assisted Benzema for the French man to put the ball on the back of the net. However, this was a sort of rare play during the first 45 minutes, and Getafe would manage to even the score close to the 40th minute, from a sloppy play ending in a rebound to Miku, who beat Casillas to put the score in 1-1 at half-time. Some fans were expecting a tottally different second half, but the truth is, nothing much changed. Real Madrid didn't push too much forward and the game wasn't prone in fast passing, as the Merengues usualy do. One of the highlights of the night was a superb bycicle kick from Cristiano Ronaldo, who hit the post and rebounded to Fábio Coentrão, who had a shocking miss just near the goal line. Around the 60th minute, the referee pointed to the penalty spot, after a doubtful tackle in the limit of the area, suffered by Cristiano Ronaldo. The Portuguese would take the responsability of taking the penalty kick and as usual, he didn't miss and restored Real Madrid by setting it to 2-1. However, Cristiano Ronaldo best moment in this game would take place in the 70th minute, in a tremendous left foot low assist to Benzema, crossing the ball from one side of the pitch to the other, leaving Benzema with the solo task of tapping the ball in. What a way Cristiano Ronaldo has to demonstrate his game awareness and solidarity with his teammates keeps improving year after year! After the 3-1, few were the ones who still believed this game could have a different story, but that was probably also true for Barcelona's match earlier today, and the Blaugrana ended by losing a 2 goals lead, conceding a draw against Real Sociedad. Around the 74th minute, Getafe managed to reduce the lead to 3-2 and put Real Madrid in alert once more, after another goal	by the Venezuelan player, Miku. However, José Mourinho's team managed to keep their area clear of danger in the following minutes and Higuain even took a chance to restore the 2 goals lead, by finishing a good individual play and putting the final score in 4-2. After defeating Getafe in La Liga, Real Madrid next match is against Dinamo Zagreb for the UEFA Champions League debut this season, in the 14th of September. 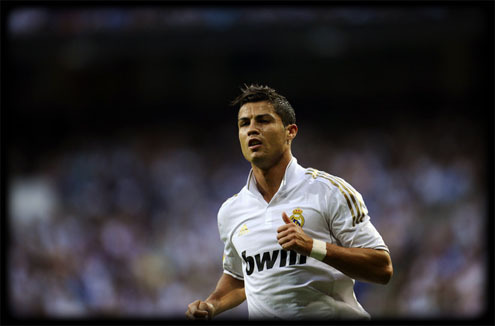 You can watch Juventus live stream, Dinamo Zagreb vs Real Madrid live streams, in our Live Games Streams section. Cristiano Ronaldo will most likely be on the line-up on this match. The countdown clock timer, displaying the time left for the next Ronaldo game, is shown on the top right corner of all pages.